Concrete that contains limestone-producing bacteria will undergo outdoor testing this winter. The bacteria are activated by corrosive rainwater working its way into the structure. "For durability reasons - in order to improve the service life of the construction - it is important to get these micro-cracks healed," Dr Jonkers told BBC News. Bacterial spores and the nutrients they will need to feed on are added as granules into the concrete mix. But water is the missing ingredient required for the microbes to grow. Concrete is the world's most popular building material, but cracking is a problem So the spores remain dormant until rainwater works its way into the cracks and activates them. The harmless bacteria - belonging to the Bacillus genus - then feed on the nutrients to produce limestone. The bacterial food incorporated into the healing agent is calcium lactate - a component of milk. 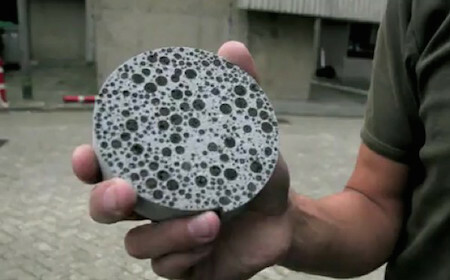 The microbes used in the granules are able to tolerate the highly alkaline environment of the concrete. "In the lab we have been able to show healing of cracks with a width of 0.5mm - two to three times higher than the norms state," Dr Jonkers explained. The outdoor tests should begin [in six months]; the team is already talking to several construction firms that could provide help. The concrete will then have to be monitored for a minimum of two years to see how it behaves in this real-world setting. It was a beautiful room all right, with opaque plastex walls and white fluo-glass ceiling, but something terrible had happened there. As it responded to me, the ceiling lifting slightly and the walls growing less opaque, reflecting my perspective-seeking eye, I noticed that curious mottled knots were forming, indicating where the room had been strained and healed faultily. Engineers at Bristol University, with funding from the Engineering and Physical Sciences Research Council (EPSRC) developed the technique. Here's how it works. The intent is that when squeezed under pressure (during a quake), the nano polymer particles will flow into cracks and harden to form a solid material. The idea of a "self-healing" surface is part of a larger set of ideas called "autonomous materials systems." If the coating is scratched, polymer capsules just a few hundred nanometers thick rupture and release their healing contents.